We got our hands on this magnificent monster of a coffee maker and I have to say that my husband and I have enjoyed getting to know how to use it. We are fans of strong coffee and so we expected a lot when we brought this baby home. The Touch Single Serve Brewing System T526S may look a bit imposing with its glowing light display and overall fanciness, yet it is very simple to operate and makes a fast cup of hot and strong coffee to boot using convenient K-cups. 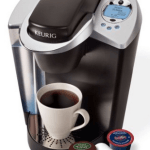 Off the top, you should also know that it is Keurig compatible, but all pods are welcome. Designed to brew a high quality cup of strong coffee within half a minute, I think that the Touch Brewer T526S is a 1-cup brewing system that will surprise you in many great ways. According to Touch Coffee, the intention behind making this machine was simply to blow similar models of single serve coffee makers away. I had heard about this machine being some kind of super-brewer for home use, and as it happened, my single serve coffee maker wasn’t brewing the best coffee, so I took a chance to see what this thing could do. So, was it all just hype? While opening up the box on my kitchen counter, I wondered if I had just invested in just another run of the mill kitchen device that looks nice but overall doesn’t have anything behind its shiny 12.2″ x 9.1″ x 14.1″ frame. Before we get into the reasons I think this is a very special machine, here’s a quick video where the makers of this machine talk about why its a cut above. The first thing I really noticed about the Touch Brewer T526S is that it wasn’t a really light weight machine, at 9.8 pounds. For a minute, that kind of bugged me. Why was this thing such a brute? Luckily, I quickly realized that this machine is supposed to be that big and that heavy, because its full of a lot of quality hardware, and so it turned out to be a pretty good omen for what was to come. Also, the size of this machine also allows for brewing any size cup you have from 6 ounces, all the way up to a full carafe. Travel mugs welcome. Size really does matter! Because of its size, I don’t feel like this machine is too transportable or really easy to move (although 10 pounds isn’t that heavy, I’m just a bit of a wuss), and that suits me fine, because I don’t really want my kids getting the idea that this is a toy. Our old brewer had a bit of a cheap plastic look to it, and so my kids really did think of it as a toy. This is a coffee maker, and its about brewing hot coffee, and I’d rather my kids weren’t fiddling with it. Actually, my youngest daughter is a little scared of it with its blue lit control panel which glows brightly if the lights are out, so I guess that’s a good thing because she won’t go near it. Its a pretty nice looking machine, wouldn’t you say? It has a bit of everything I like to see – its sturdy, stands tall, but has a few curve, a great design aesthetic, and everything is clearly labelled. Appearance-wise, I was already pretty satisfied with this machine right out of the box. The Touch Brewer T526S is very simple to use. One touch only and you are getting your coffee the way you want it, and quick as well. 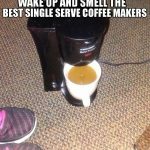 With the push of a button and get a mild, medium or bold strength coffee, and the settings are quite accurate in this regard. Depending on my mood, I like different types of coffee strengths and flavors, so that works just fine for me. I personally like that the doesn’t limit me, so I can use any type of K cups (extra bold, extra large or re-fill jumbo cup). Basically you can get any flavor of coffee you want, and use any size of pod you want. Here is a great review of the Touch Brewer T526S Single Cup Coffee Maker. I will chime in afterwards with my thoughts on this review. One thing that this reviewer said which I can confirm 100% is that this machine does have an incredible ability to heat water quickly. The inside system of the Touch Brewer T526S heats the water within 20 seconds and then “interacts” with the coffee in the K cup, brewing your coffee in literally 30 seconds and extracting maximum flavor. The Touch Brewer T526S reaches the ideal temperature between 195-205 degrees and provides us with super hot, strong coffee each and every time! The way it works is quite simple – to get started just fill the water tank (it holds 90 ounces, and yes it is very large) with water. It would be great if you have filtered water because it will keep your brewer in good shape for a long time. I use a Brita – nothing too crazy, but it does taste better. Now, people say that T526S has a very large tank, I say, the larger the tank, the less times you will have to refill it, and that’s a good thing. Anyway, next, you can pull the handle to open the machine and drop your chosen cup inside. As I mentioned above, this T526S gives you the freedom to choose any type of K-cup you want, so this brewer is fully compatible with all portion packs, including K-Cups. Close the lid and then choose from eight cup sizes starting from 6, 8, 10, 12, 14, 16, up to 18 ounces and carafe. Do not worry; no matter how much water you have poured inside the tank, the brewer will only heat just the right amount of water, or the selected cup size. This is by far one of the best features I’ve seen in an electric 1-cup brewer. All you have to do is push a button and wait for your coffee to be brewed. One minute or less later, you’ll have a full cup of coffee. To me this validates the price, which isn’t exactly what you’d call cheap. Another thing that I love about the T526S is that you don’t have to wait for the brewer to reset before brewing another cup of coffee. All you have to do is remove the used cup, replace it with a new one, then simply close the lid, again select the cup size you want, and that is all you have to do. The T526S is ready to prepare another cup for you. The T526S comes with a 26-ounce carafe and I find it very practical for preparation of more than one cup of coffee. If you live in a household where more than two people love to have fresh coffee in the morning, this carafe will help you a lot. To use the carafe, remove the red cup holder from inside the machine, as well as the drip tray. Don’t forget to fill the Refill Jumbo Cup to the rim with your preferred ground coffee, and then insert the Refill Jumbo Cup into the brewer. The carafe goes underneath. Then simply press the “Carafe” Button. This is all about the using of the carafe. In this case, the T526S will brew a pot of drip coffee in about three minutes. Here’s another review of this machine. One thing I disliked here is that the there is no drip tray that will accommodate the carafe. Everything else was pretty good and I’m happy with the machine overall, from the looks, to the speed and the coffee quality. When comes to price, the price isn’t what you’d call inexpensive but you do gt a lot for your money. Plus, I would call this an investment in home brewing equipment. Because this thing is pretty much an all-in-one unit, you don’t even need a coffee grinder.